My main residence, work shop, and farm is in the rolling pastures of the Old Bellamy Plantation outside of Monticello Florida, just south of the Georgia line. It is in the heart of plantation country. My summer studio/work-shop is in the Smoky Mountains of Western North Carolina. I grew up in rural northern New Jersey, across the street from a hunter-jumper show barn…and have been in love with horses since I can remember…art came a little later in elementary school, and of course, I drew horses! My first horse was actually a pair of donkeys, which I rode as if they were jumpers, setting up broom sticks straddled across buckets to practice jumping. My following horses were mostly thoroughbreds, with my focus on jumping. As a teenager I would try anything, including exercising race horses. When I went to college, I had to give up my horse. From my attendance in college, until our daughter went to college, I was horse-less! When I felt free to pick up riding again, dressage stole my heart, and still holds it. This is evident in my drawings! I now have the horse farm I have always dreamed of owning! Beautiful rolling pastures with huge live oak trees, which are a part of an old plantation. I have two horses of my own, a Canadian Thoroughbred and a sweet little 4 year old black & white paint horse. Sharing this little piece of paradise are some delightful boarders. A German friend with his Italian wife keep their Quarter horses here, and my lovely neighbor shares my south pasture with two gorgeous grey Passo Finos. In the summer I load up my little paint horse and all my art stuff and move to North Carolina for the season. My Mountain Creek Studio is a little stone cottage on a mountain side overlooking my horse in his pasture, and with a spectacular view of the Smoky Mountains. The scene out my window changes with every hour as the sun burns off the morning fog. It is so conducive to creativity…and the trail riding is out of this world! Out of college, my husband (an amazing classically trained artist) and I, started a decorative metal casting business. I designed, and we manufactured high quality gift & costume jewelry lines, that were promoted nation wide. Also producing specialty products for major corporations and athletic events. Mountain Creek Studio is where I make my drawings for my cut and and stained trays and jewelry. 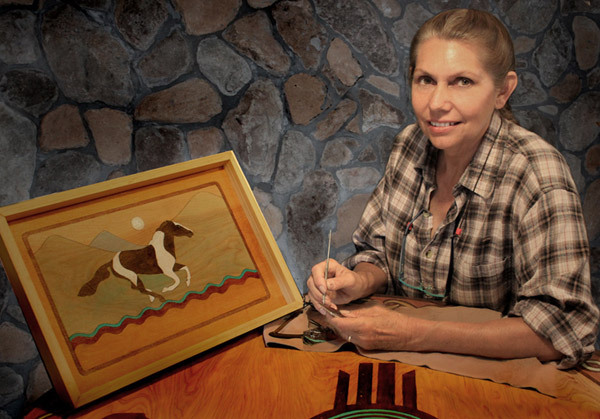 Many are one-of-a-kind art work, with wild life, bears, birds, game, Native American spirit animals and symbols. I belong to and exhibit at a wonderful artists guild with its own gallery in the mountains called Stecoah Artisans Gallery. My work sells very well. 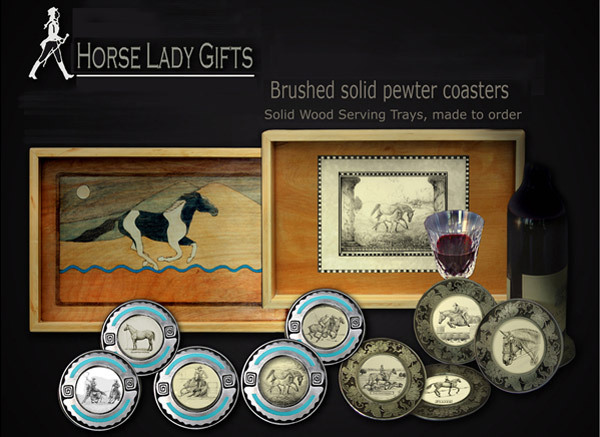 You create lovely horse theme coasters and serving trays, what is your best seller? 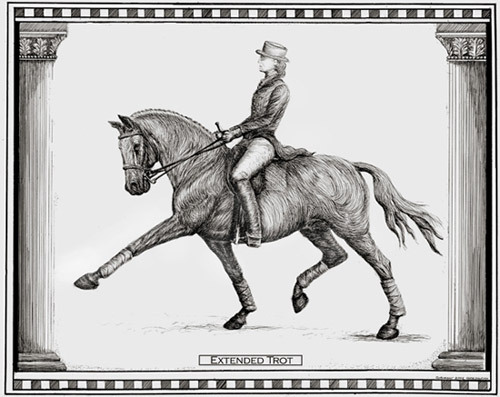 The best and most consistently re-ordered items are the wine coasters with the Champion (dressage horse head) and the mare & foal pasture scene, the show hunter jumping and usually sets of dressage movements (extended trot, half pass, canter pirouette, piaffe’ or passage), also the fox hunting scenes. These products involve a variety of art forms. Which is your favorite form of expression & who are your main artistic influences? I have been drawing all my life, but I feel that I have only found my real artistic voice in the past 10 years. 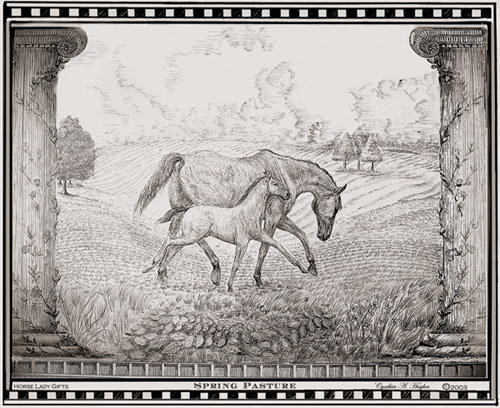 Two of my main influences are my husband, who is an artist, and his great-grandfather, the famous engraver Timothy Cole, whose intricate engravings are forever a goal to move toward. The artists I admire are too many to list, but I can say those that have influenced my horse-art specifically are the 16th & 18th Century painters Hamilton and Stubbs, and engravers Piuvnel (1600’s) and Durer (1500’s). For inspiration, I need look no further than my window…either here in Florida or at our summer home in N.C. There is always something I am creating or planning to create. My drawings are studies of the horse’s power and grace in motion. I developed a “finger print” style of engraving line on the horses, contrasting with a tighter line style in the balance of the image. adding touches of ceramic inlay for a burst of color. 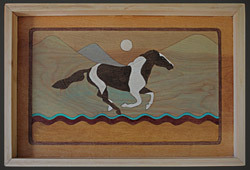 I have recently added woodwork as a medium, for my colorful native American inspired cut and stained trays. What effect do you think the Internet will have on the art world? I am amazed at the growth of the Internet and visits to my site I think it will only grow! Which one is your personal favorite item? I guess I would say my personal favorite is the mare & foal scene “Spring Pasture”. It is one of my top sellers, and I had a lot of fun drawing it because it is my pasture and I used my TB gelding for the mare model. I have always been a proponent of good diet, exercise, and staying spiritually grounded. Native Americans have a symbol or power animal called the “Heart Deer”, which is a reminder that I must “honor that which sustains me”. In my own understanding, this means I should always use that which I have been given in talents and resources in a way that honors these blessings. Thanks to Cindy for answering the interview and sharing her work. Be sure to check out her horse gift site periodically for updates about her latest works. This entry was posted in Interviews on December 3, 2009 by The Equinest.